Stuart Andreason just posted earlier today about some of the "good, bad, and unknowns" of using social media. As a quick follow up, I wanted to mention an interesting example of social media being used effectively at the national level -- through what was called a "Twitter Town Hall." Top administrators from HUD, EPA, and DOT took questions from across the country (sent in as tweets) about the three agencies' joint Partnership for Sustainable Communities. The Town Hall was a live web broadcast in which selected incoming tweets were responded to. As one who tried to multi-task by following the tweets, while watching the video cast, while also tweeting in some questions of my own -- I thought the questions chosen to put to the three administrators were fairly representative of those being tweeted in. Planners and planning commissioners take note: there were actually quite a few substantive and important issues discussed. I'm setting out the 46 minute long web broadcast below (note; move the slider to the 2:00 minute mark, where the discussion actually starts). 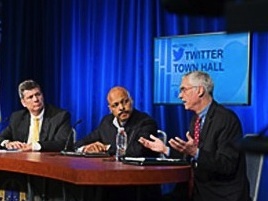 For more about the Twitter Town Hall and about the Partnership for Sustainable Communities.